Hundred of friends, family, politicians and dignitaries attended funeral services Tuesday for longtime U.S. Rep. Charlie Bennett, 92, who died over the weekend. The service attracted Jacksonville city leaders and dignitaries spanning generations, many who called Bennett a hero. "He was always kind of a role model because of his honesty ... and I represent this area now in the Congress," U.S. Rep. Ander Crenshaw said as he arrived at the funeral. "He left a lasting legacy, and I'm just proud to be here an honor him." If you can emulate a public servant, he's the one you want to emulate," Duval County Property Appraiser Jim Overton said. "He's an icon in our time." During the 45-minute service he was eulogized by long-time friend Doug Milne and his daughter, Lucinda Bennett. The funeral will be 11 a.m. at Riverside Avenue Christian Church. Bennett will be buried in Arlington National Cemetery. Pastor of Riverside Avenue Christian Church, the Rev. Fred Woolsey, recalled one of the Bennett's more lasting marks on America -- a bill he sponsored in 1954 adding the words "In God We Trust" to the nation's coins and currency. "He did not do that because he saw popularity. It was done because he believed that trust in God is the vital basis of life. It was the motto of his life and the source of his own faith," the Rev. Fred Woolsey said during the service. President George W. Bush, in Jacksonville for a reelection campaign fundraiser and speech at a Riverside elementary school, didn't attend the services, but but took time at to remember Bennett as "a man who served his county and this community ... who was an honest, honorable, decent man who loved America." "Our thoughts and prayers go to his family during this tough moment," Bush said. Bennett was Florida's longest serving congressman, serving more than 44 years under nine presidents before retiring in 1993 to take care of his wife, Jean, after she had a stroke. "I would not want such personal defects in me to hamper the service that a U.S. representative should render," he said at the time. He's remembered for many accomplishments during his congressional service, including creating an ethics code for government service. Bennett also was a historian and wrote several books on Florida's early history. He was instrumental in the creation of the Fort Caroline National Memorial in Jacksonville and the Timucuan Ecological and Historic Preserve. Bennett was known for always taking time to talk to constituents when they visited Washington. Besides his wife and daughter, Bennett is survived by his two sons, Bruce Bennett, of Lake Worth, and James Bennett, of Glastonbury, Conn.; and three grandchildren. Charles E. Bennett, 92, a Florida Democrat who served 44 years in the U.S. House of Representatives and earned the nickname "Mr. Clean" for championing ethical reforms, died Sept. 6 at a nursing center in Jacksonville. He had a stroke and a heart attack last year. Rep. Bennett was elected to the House in 1948, representing the Jacksonville area, and declined to seek reelection in 1992. His career was underscored by a devotion to reform packages, from political ethics to animal rights, and legislation to help those with disabilities. A co-sponsor of the Americans With Disabilities Act, he himself was disabled after contracting polio during World War II, when he was a guerrilla fighter in the Philippines. He spent his years on Capitol Hill using a wheelchair or cane. He practiced financial disclosure in the 1950s, helped establish a permanent House ethics committee in 1967, consistently voted against congressional pay raises and returned thousands of dollars of disabilities checks, believing it was wrong to accept two salaries. Rarely did he miss a roll-call vote. His Florida district was home to naval air stations, and he became the second-ranking Democrat on the House Armed Services Committee. In the 1980s, he supported funding for more-conventional weapons and reductions for President Ronald Reagan's Strategic Defense Initiative program, a space-based antimissile system. He was successful in his fight to curb SDI spending. However, his time on the committee was marked by a great disappointment. What many viewed as his crusading instinct and distance from the clubby political atmosphere contributed to two upsets when he ran for the committee chairmanship after waiting in line for decades. When aging Chairman Melvin Price (D-Ill.) was deposed in 1985, Rep. Bennett was defeated by Les Aspin (D-Wis.), who had far less seniority. In 1987, after Aspin was initially ousted in a no-confidence vote, Rep. Bennett came in third, behind Aspin and Marvin Leath (D-Tex.). The loss stung as it had decades earlier, when he was not named to the House permanent ethics panel, officially called the Committee on Standards of Official Conduct. Having played a giant role in forming the committee, he called it "the heaviest rebuke ever given in the Congress." In the mid-1970s, after the Watergate scandal, he got a seat on the committee and rose to chairman. 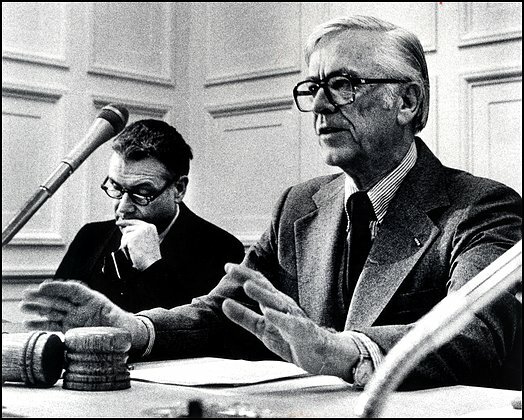 During his term, the panel oversaw the Abscam bribery scandal and recommended the expulsion of Rep. Michael J. "Ozzie" Myers (D-Pa.) for corruption. House Speaker Thomas P. "Tip" O'Neill Jr. (D-Mass.) replaced Rep. Bennett as chairman with Rep. Louis Stokes (D-Ohio), a frequent committee critic. In his spare time, Rep. Bennett wrote several books about Florida history and gave away the proceeds. Charles Edward Bennett was born in Canton, N.Y., and raised in Tampa, where his father worked for the U.S. Weather Bureau. He was a graduate of the University of Florida at Gainesville and its law school and president of the student body. He practiced law in Jacksonville until 1941, when he ran successfully for the state House of Representatives. There, he turned down a businessman's offer of a new desk, considering it too costly a gift. He made a brief run for the U.S. House before enlisting in the Army and serving in the South Pacific during World War II. His decorations included the Silver Star and Bronze Star. In 1948, he ran against incumbent Rep. Emory H. Price (D). Rep. Bennett's successful platform included opposition to President Harry S. Truman's civil rights program. During the 1950s and 1960s, he voted with many southern Democrats against civil rights and Great Society programs, including Medicare and the 1964 Civil Rights Act. Then, in 1965, he said he had a change in conscience. He broke with the southern bloc to support the 1965 Voting Rights Act, arguing that previous bills sought "compulsory intermingling of races" but the voting rights measure was based on a "constitutional obligation." "It may take courage for some of you to do this," he said on the House floor. "Some constituents do not remember who won the War Between the States. Remind them that the greatest of all southerners, Robert E. Lee, wrote his mother, 'Recollect that we form one country now.' "
He added, "We should show to the world that southern legislators and their constituents are today living in the southern traditions of high principle and clean courage." Under Rep. Bennett's lead, the House approved a code of ethics in 1958, but he found resistance to a standing committee to enforce it. Many powerful members feared that such a panel would facilitate political smear campaigns. In the mid-1960s, as the House was investigating alleged financial wrongdoing by Rep. Adam Clayton Powell Jr. (D-N.Y.), Rep. Bennett chaired a study group that made recommendation on a permanent ethics committee. Rep. Bennett said he would stay off the permanent committee if it would help his cause. It did. His 22-year-old son, Charles Jr., died in 1977 from a drug overdose, prompting Rep. Bennett to sponsor anti-drug legislation. Survivors include his wife of 50 years, Dorothy Jean Bennett of Jacksonville; three children, Lucinda "Cindy" Bennett of Jacksonville, Bruce Bennett of Lake Worth, Fla., and James Bennett of Glastonbury, Conn.; and three grandchildren. Rep. Bennett, though most identified with ethical causes, also had a place in political lore sponsoring the legislation that made "In God We Trust" the national motto in 1956. JACKSONVILLE, Florida - Former U.S. Representative Charles E. Bennett, Florida's longest serving congressman and a principal advocate for ethical reforms in Congress, died Saturday of natural causes. He was 92. Bennett died at a nursing center, said Ramon Day, Bennett's former chief of staff. Bennett suffered a stroke and a heart attack in October and was hospitalized for a month. The Jacksonville Democrat had served in Congress for 44 years when he retired in 1993. Nicknamed "Mr. Clean," Bennett sponsored legislation to create the House Ethics Committee and served as its first chairman. During his early service, Bennett refused his congressional paycheck, saying he had simple tastes and didn't need the money. He also voted against congressional pay raises and refused to accept them. "My father spent his life dedicated in service to this country," said his daughter, Lucinda Bennett. "There will never be another Charlie Bennett. My dad's honesty and service were exemplary." Bennett was born Dec. 2, 1910, in Canton, New York, and earned bachelor's and law degrees from the University of Florida in Gainesville. He served in the Army in World War II, receiving a Silver Star and Bronze Star. He also contracted polio during the war, but was able to walk with two canes. Once asked to list the most important legislation he sponsored, Bennett listed the making of "In God We Trust" as the U.S. motto and requiring it be included on all coins and currency; creating an ethics code for government service; cosponsorship of the bill enacting the Americans With Disabilities Act; and legislation providing federal assistance toward school construction. He retired to care for his wife after she had a stroke. Bennett also was a historian and wrote several books on Florida's early history. Besides his wife, Bennett is survived by his daughter, two sons and three grandchildren. A funeral will be held Tuesday. Bennett will be buried in Arlington National Cemetery. BENNETT, Charles Edward, a Representative from Florida; born in Canton, St. Lawrence County, New York, December 2, 1910; moved with his parents to Tampa, Florida, in 1913 and to Jacksonville, Florida, in 1932; attended the Tampa schools and was graduated from the University of Florida at Gainesville, J.D., 1934; was admitted to the bar the same year and commenced the practice of law in Jacksonville, Florida; member of the State house of representatives in 1941; during the Second World War enlisted in the United States Army on March 13, 1942, and discharged as a Captain of Infantry on January 13, 1947; served overseas in New Guinea and the Philippines, including guerrilla fighting on Luzon; awarded the Silver Star, Bronze Star, and Combat Infantry Badge; elected as a Democrat to the Eighty-first and to the twenty-one succeeding Congresses (January 3, 1949-January 3, 1993); chairman, Committee on Standards of Official Conduct (Ninety-sixth Congress); was not a candidate for renomination in 1992 to the One Hundred Third Congress; is a resident of Jacksonville, Florida.